The early bird prices have now expired and orders from 22 August 2017 onwards will be charged the normal full price as shown below. Delivery Update 9 Oct, 2017: Materials for the first half of Year B have just arrived from Australia and will be despatched to customers in NZ by the end of this week. Download, print and complete the order form below. 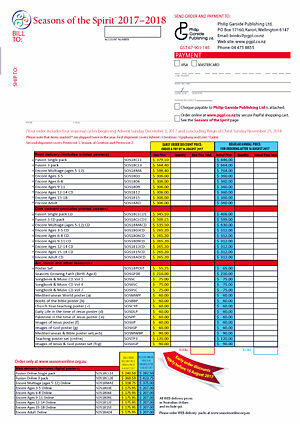 You can post the order form to us with your cheque or with Visa/MasterCard details completed. OR you can fill in the form in Arcobat, save it and email it to us as an attachment. 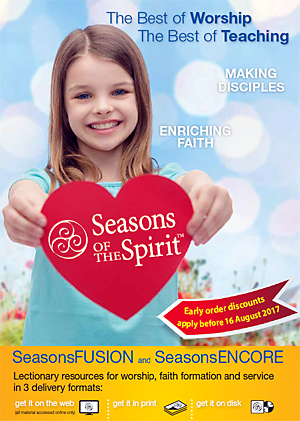 Seasons of the Spirit is a lectionary-based resource created in community with congregations representing different denominations from Canada, the USA, the UK, Australia, and New Zealand. Prices include GST and postage/courier within New Zealand.